Boys’ soccer has two new coaches who are already making a lasting impact on the team. 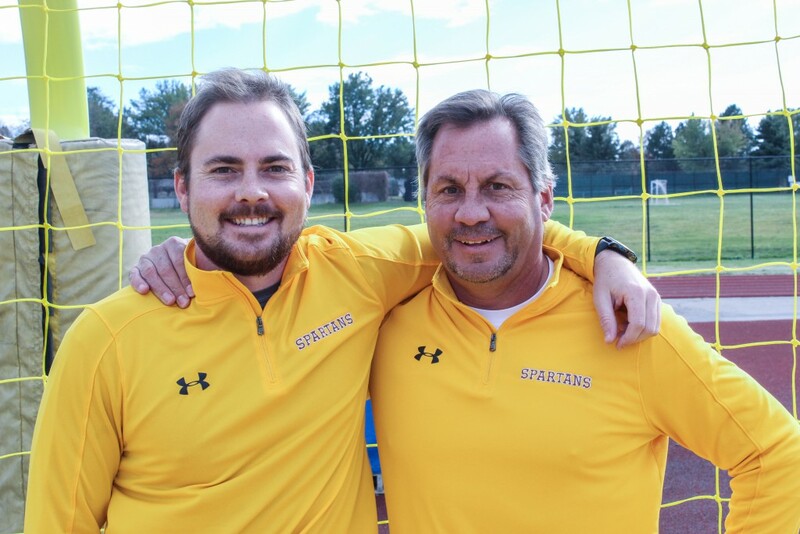 The father-son dynamic duo made its mark as the John Thompsons took on coaching boys’ soccer this fall. As the new head coaches of boys’ soccer, the duo put their passion to work by creating a unique and dynamic environment for their players. John Thompson Sr., lovingly referred to as “Old Thompson,” or OT, is the junior varsity coach that hopes to make district champions out of his squad in the years to come. He has been active in the sport for almost thirty years, and is honored to be a part of the Spartan community. When his soccer career ended after college, he immediately began to share his love of the game with aspiring athletes as well. “I wanted to pass the game on. I enjoy doing it and it is fun watching the players go out, play, and enjoy themselves while learning something too.” OT has a long-standing passion for soccer, and was honored when his son offered him the job of JV coach. When it comes to coaching philosophy, he says, “It is all about playing for each other, working hard, and being good sports.” In his eyes, it is important that everyone is included and has fun, while also being able to learn valuable team skills. Outside of soccer, OT is the CEO of Clarity Implant Solutions, a company that provides helping services that support payers with high cost implant charges. Ironically, he went to Thomas Jefferson High School in Washington many years ago, where he played soccer and golf. OT has been playing soccer and golf since he was very young, and enjoys playing both as a hobby. OT also enjoys mountain biking around Colorado, and likes heavy weight lifting as well. The younger John Thompson, otherwise known as JT, has experience of his own, saying, “My playing career ended in college, and that was where I wanted to stop. I wanted to keep being a part of the game, so I thought coaching was the way to go.” JT’s experience heightens his coaching abilities, leading the varsity team to an impressive record of 11-5-1, with his team attending the second round of playoffs for the first time in twenty years. Junior Alfredo Cortez explained that JT is, “so focused and concentrated on the game; he can’t think about anything else but soccer.” Not only was JT a source of motivation on the sidelines this season, he was also an adult players could trust. Alfredo explains that JT is “a funny guy; you can have a conversation with him and he won’t be awkward.” JT also has an impressive life outside of his successful coaching career, as he is a Claims analyst for Clarity Implant Solutions. OT is JT’s boss, which strengthens the bond they share. In the off-season, JT enjoys exercising and weight lifting, just like his father. JT adds golf to the list of comparisons the father and son have, as he has been playing golf for 17 years. The boys’ soccer coaches worked together very well this season and provided a positive environment for their players. OT started coaching when JT was 16 years old, and JT started coaching when he was 25 years old. JT explained, “We go at it every once in a while, but it is all in good fun.” The duo shares many hobbies and lifestyles, whether it is their work environment or their love for exercising around Colorado. When it comes to the TJ soccer coaches, the bond they share amplifies their coaching abilities. The Thompson family is a very close bunch, and feel that “TJ is a great part of that.” Both coaches provide a supportive atmosphere, which will have a lasting impact for many years to come.